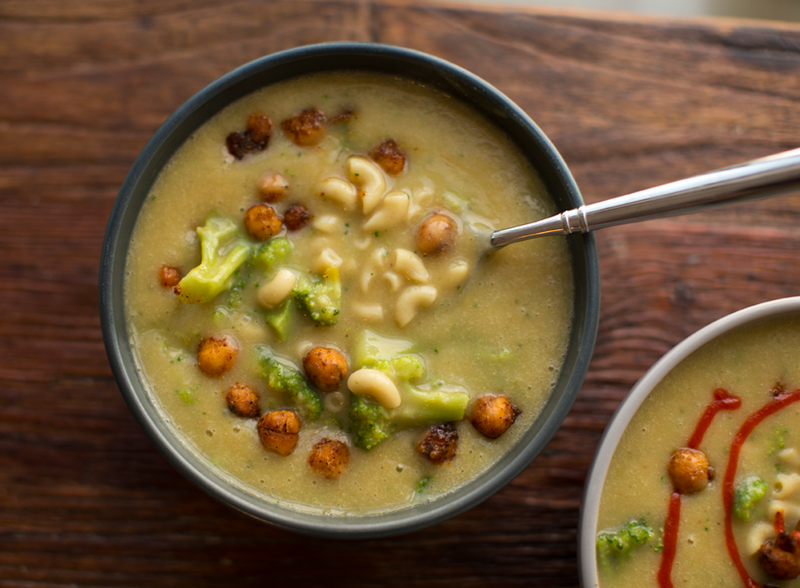 Cheesy Potato Broccoli Macaroni Soup. When Comfort Food is in Order. 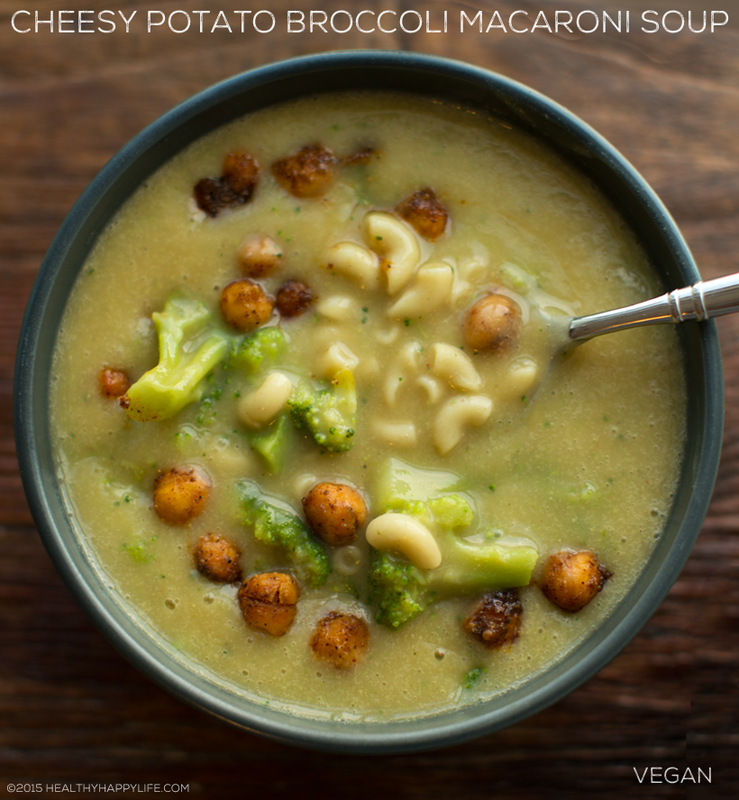 This Cheesy Potato Broccoli Macaroni Soup is warm and soothing, light, yet rich. Its creamy potato base is studded with tender florets of broccoli and macaroni pasta. 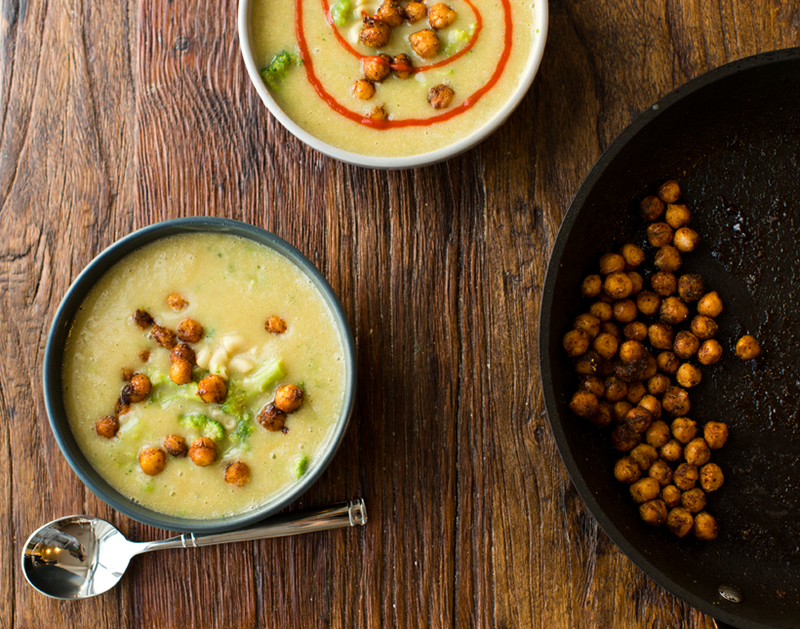 Accents of smoky and peppery spices and vegan cheesiness in each spoonful. 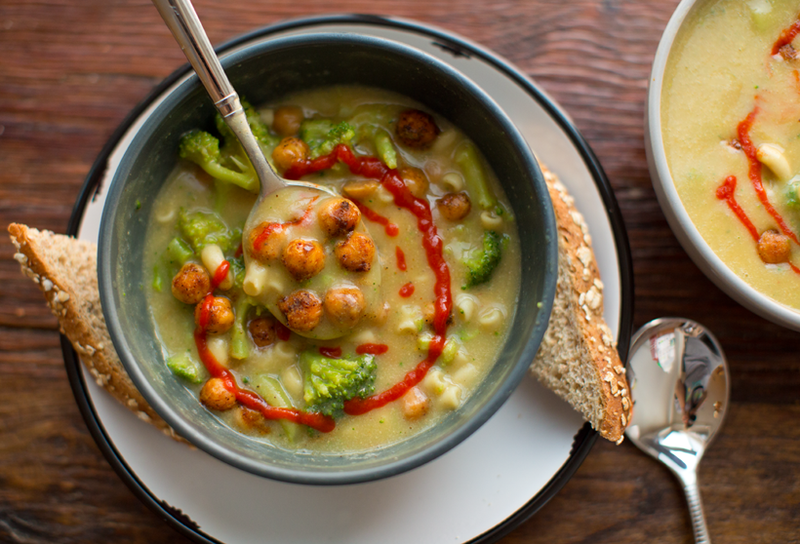 On top, a hint of spice with spiced skillet chickpeas and an optional swirl of sriracha. 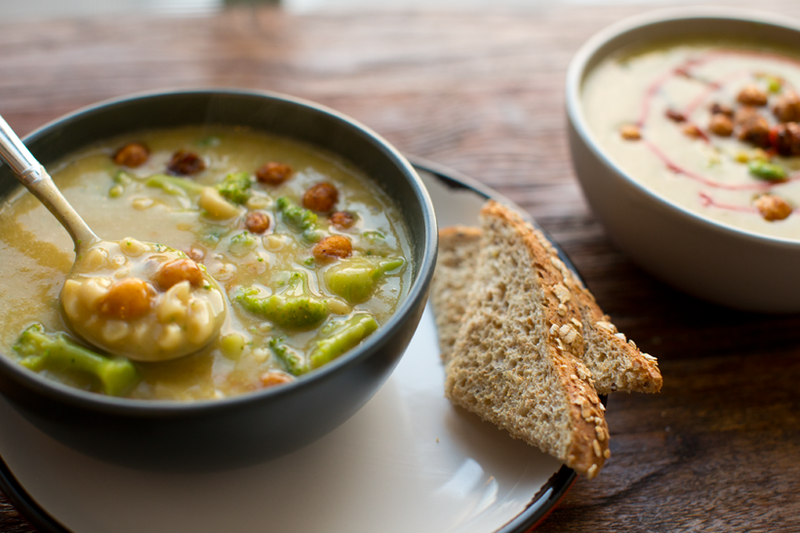 Get the recipe and some thoughts of comfort and happiness today #HappyZone..
Life is short. Never hesitate to follow dreams and seek out happiness even if you have to go against what people expect of you. And even if others do not understand your path. Your life if yours to create and to experience. You create your life story every day. One day I hope I look back on my life and say, "What a crazy, beautiful, happy life I have lived." What Makes You Happy and Safe? Finding out what makes each of us really and truly "happy" is a life long journey of discovery. Just think. You may have not even discovered yet the place, person, activity or thing that makes you the happiest of all. Maybe you have yet to travel there. Try it. Meet them. Own it. Feel it. Maybe even taste it. Because obviously, recipes and foods can absolutely be doors to happiness and comfort. My reflective mood today and lately is mostly because of a few things happening around me right now. My heart feels a bit heavier than usual. And I notice myself feeling extra thankful for the projects and people in my life that make me feel warm and fuzzy and full. Lets call those happy zones. Happy Zones. Each day, I make an effort to seek out situations I like to call "happy zones." In this post, I listed 101 Things That Make me Happy .. you can see all those types of things that make me happy. More happy zones = a happier day. And sometimes you have to claim you own happiness. We are all going through something now or soon or in past tense. So whatever YOU are making your way through right now, I truly hope you can find your "happy zones" in each day. 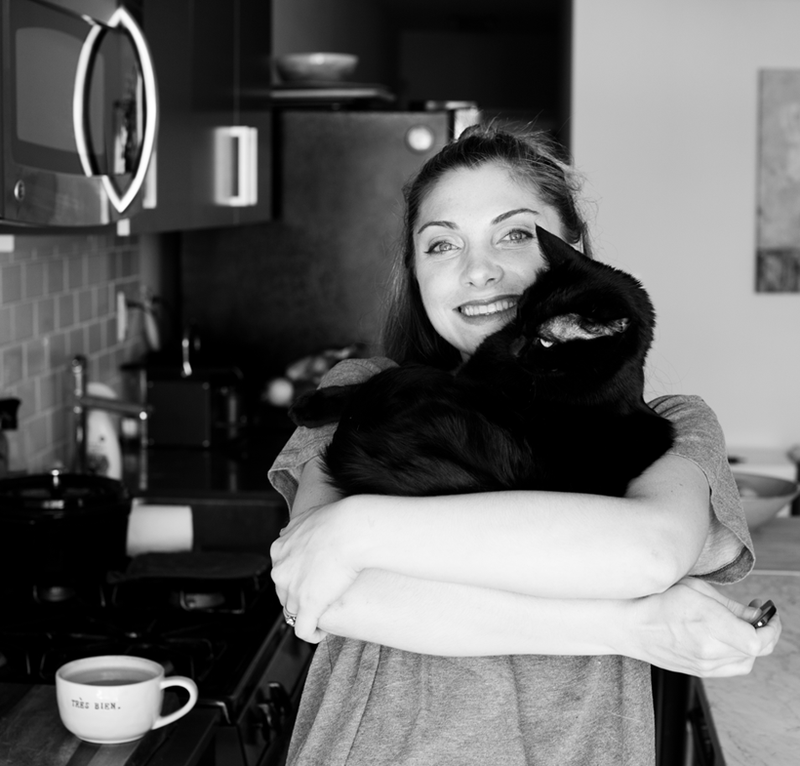 And I hope my blog is a space of inspiration, warmth and comfort and my recipes are an activity that make YOU feel warm and fuzzy and full. Soooooo. Comfort food. I have been craving everything comfort food lately. And that means potatoes. Sweet potatoes for soup and bowls and even white, red and purple potatoes for mashing and soups. Like this one. 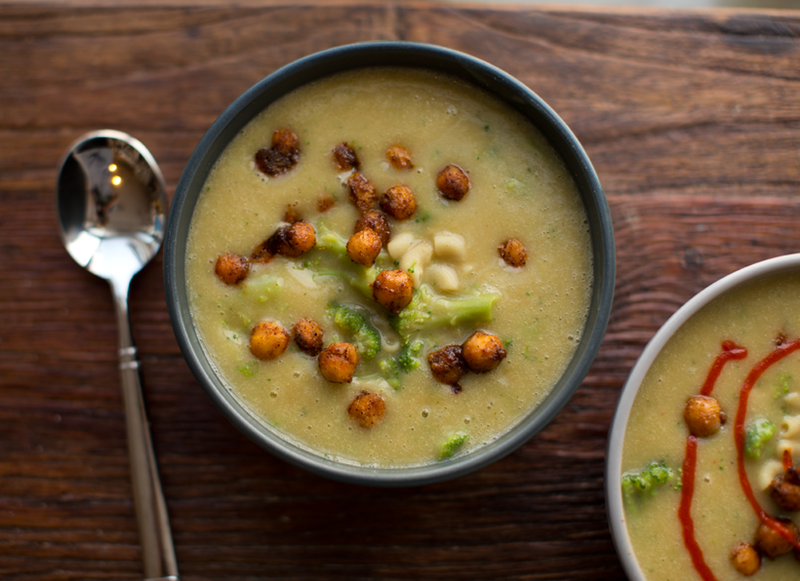 This soup is half Vitamix-blended - so the potato broth is rich and creamy, yet not too heavy. I didn't want 'heavy' for the base of this soup. I wanted the pasta and broccoli to add the true depth and richness. If you want a heavier/thicker potato broth, simply reduce the veggie broth amount added. 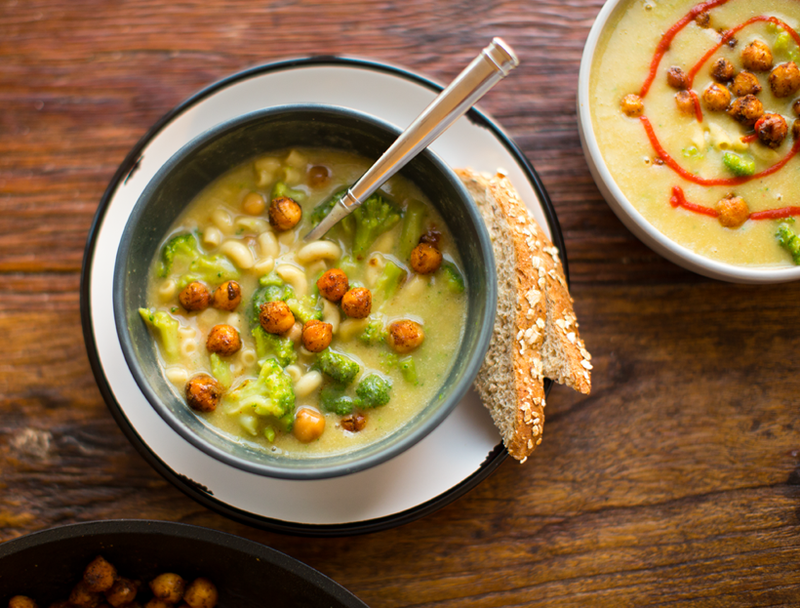 Warming and soothing, this cheesy-potato broth is loaded with tender florets of broccoli, chickpeas and macaroni pasta. Dinner-in-a-bowl! Wash and scrub your potatoes. I use a fruit/veggie spray and lightly scrub and rinse in a large mixing bowl filled with water. Chop your potatoes just enough so that they are all the same size. The smaller you chop them the faster they will cook. Add a pinch of salt to a large pot of boiling water. Then add the potatoes. 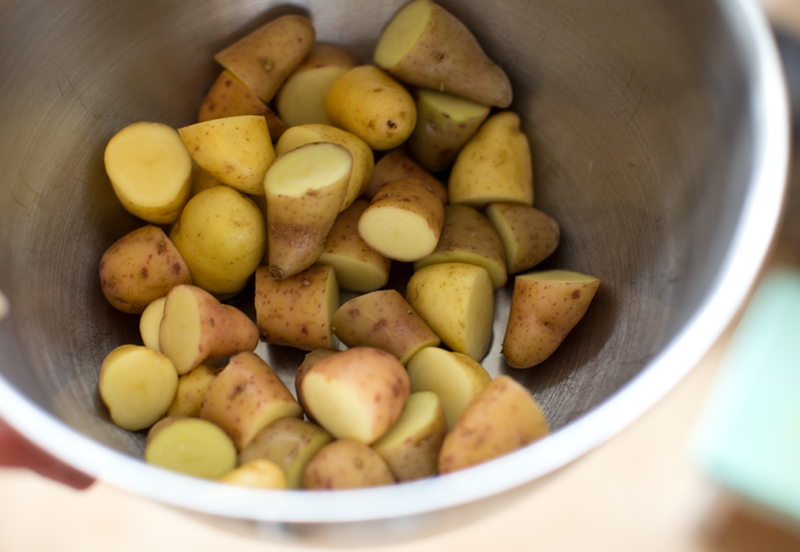 Boil until the potatoes are tender enough to break apart with a butter knife or fork. Drain potatoes and add them to the blender - like a Vitamix. Add all the "blender" soup ingredients. Start out with 3 cups of veggie broth and add more if you want a thinner, brothier soup like I made. Blend until silky smooth. In a small soup pot you can cook the macaroni pasta. I like to do this separately for this soup so that the soup down not get too thick and the pasta does not over cook. Pour the blended soup into a large clean soup pot and set heat to medium. Add in te broccoli, bay leaf and additional spices. Allow the soup to simmer, stirring occasionally for at least ten minutes, longer to thicken the soup. A few minutes before you want to serve the soup, you can add the pasta in. If you simmer the soup too long with the cooked pasta, the pasta will over cook and possibly break up a bit and become very soft. 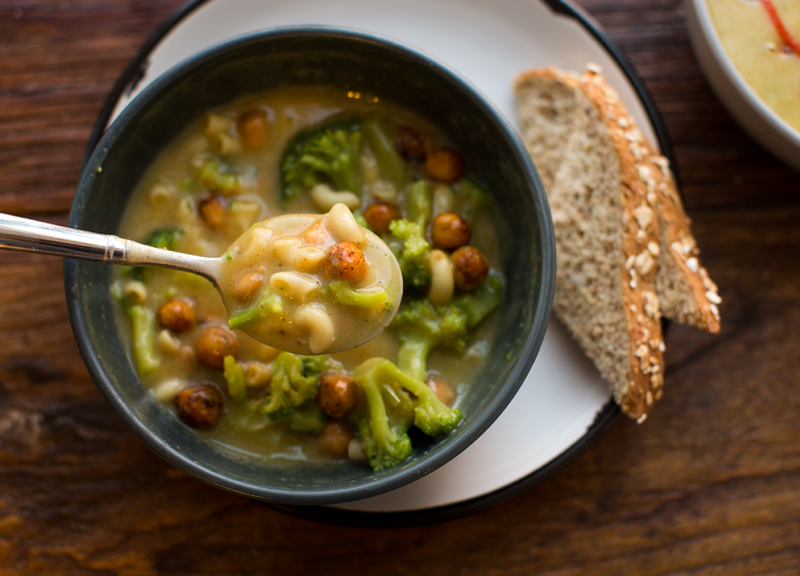 While soup is simmering still, you can whip up your chickpeas. Warm the oil in a skillet over high heat and add the chickpeas. Sizzle and cook them for 2-3 minutes, until they start to turn lightly brown. Add the spices, maple and vinegar. Shake the pan and cook until all the liquid is absorbed and then turn off the heat to let the chickpeas rest in the skillet until needed. 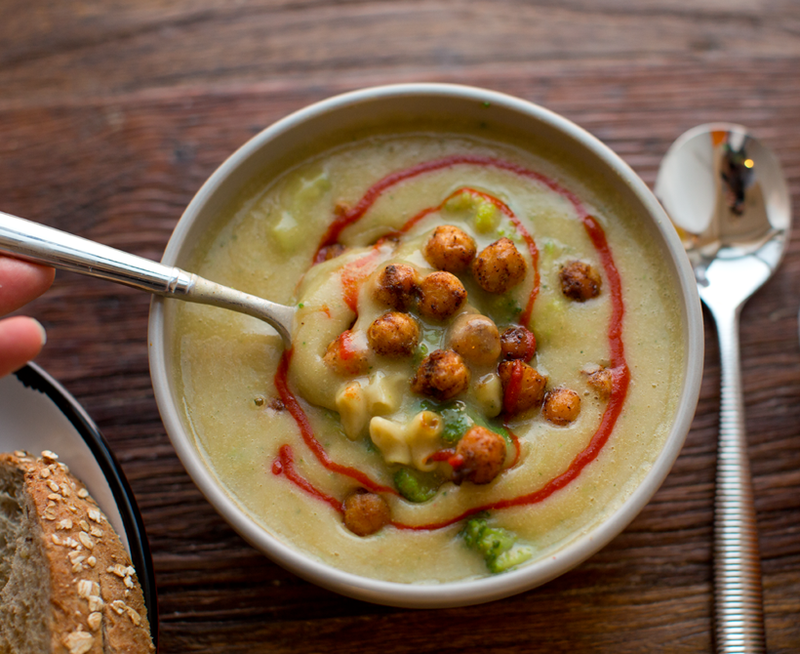 To serve, add soup to your soup bowls and top with the chickpeas and optional swirls of sriracha. Toast on the side.